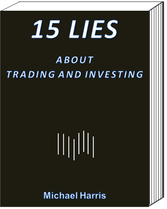 The purpose of this book is to expose certain lies about trading an investing that are presented as indisputable facts, usually by individuals who have limited or no real exposure to the markets, or by those who desire to gain authority from having discovered some rules that offer a path to wealth. This book if offered as a bonus to Book, Premium Articles and Market Signals subscribers. Click here for all subscription options.